84 South Development TIA - TADI - Traffic Analysis & Design, INC. 84 South Development TIA - TADI - Traffic Analysis & Design, INC.
TADI's Role: To prepare a comprehensive traffic analysis of the site and surrounding roadway system to determine future modifications needed to maintain efficient traffic flow with buildout of the large multi-use development. 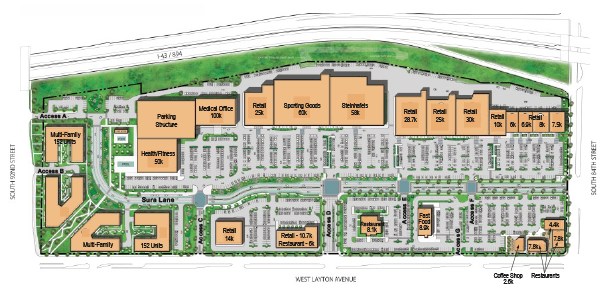 The Greenfield development is a large mixed-use development with about 485,000 square feet of commercial space and over 300 condominium/townhouse units on a 50-acre site in Greenfield, Wisconsin. On-site commercial uses are proposed to include a medical office, health/fitness club, sporting goods store, furniture store, general retail space, and restaurants. Sura Lane, a new City roadway is proposed to extend the length of the site, providing bicycle and vehicular access between the site’s access driveways to the main roadway system and the parking areas for each on-site use. At full buildout, the mixed-use development site is expected to generate over 25,000 driveway trips per weekday, with about 2,000 trips occurring during the weekday PM peak hour and about 2,600 trips occurring during the Saturday midday peak hour. The impact of these trips were evaluated for the study intersections within and around the site to determine what modifications were needed to maintain traffic flow and minimize delays and queues during the peak hours. Recommended modifications included new signal installations, two-way and all-way stop control, corridor signal coordination, median closures, additional turn lanes, and turn lane extensions. Roundabout control was evaluated and recommended as an alternative to traffic signal control at one location.